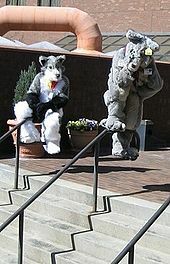 Atlanta, Georgia, USA - The Sheraton Gateway Hotel was booked solid this weekend, as hundreds of fans descended upon Atlanta for a weekend of fur, fun . . . and, in one case, diving down the stairs. Furry Weekend Atlanta reported near-record growth this year, with paid attendance jumping 37% from 557 to 762, making it the 4th largest furry convention. On numerical terms, this growth almost equals that of two years ago, when the number of con-goers nearly doubled from 270 to 500. The hotel is a perfect size for us currently and hopefully we will continue to be there for the next few years. Attendees were generally positive about the move, citing such factors as the increased size of the Dealers' Den and the quality of the rooms, although the pricing and availability of refreshments was a concern. 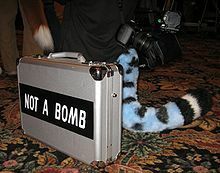 The convention included a tribute to Kimberfox, a long-time fursuiter who died early this month. Artists Strider Orion and Daria McGrain were present as guests of honor.